The project is supported by the Exchange Committee of the Federal Antimonopoly service (FAS) of Russia, fat-and-oil Union of Russia and representatives of the industrial community. "The launch of the trading of sunflower is the next stage of development of a commodity market of the Moscow Exchange. Now participants of the market of sunflower will be able to take advantage of the stock market: transparent pricing, minimizing counterparty risk and reliable infrastructure for storage and delivery. For us it is important that you start trading new goods is carried out with the support of the largest participants in the oil and fat industry, which helps create a liquid market of oilseeds on the stock exchange", - said Igor Marich, managing Director for cash and derivatives markets of Moscow exchange. "USDA appreciates the beginning of the oilseeds trade on the Moscow exchange. This will facilitate the transparency of transactions, expanding the number of players in the market, stabilize prices and reduce volatility during the year. In the current year, sunflower harvest will total about 12 million tons, that is, on the one hand, a record harvest for Russia, on the other hand this is insufficient for the oil companies. In the framework of the decree of the President of the Ministry of agriculture has set an ambitious target of doubling exports while oil and fat is one of the key drivers of the whole program," said Deputy Minister of agriculture, Oksana LUT. 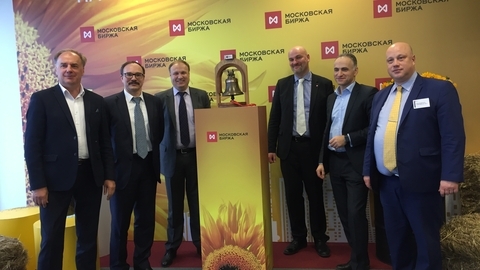 "Today's opening of exchange trading on the spot sunflower - key the culture of fat-and-oil complex of Russia is the most important step towards the creation of modern financial instruments for hedging the price risk of producers and processors. Forming a transparent regional price indicators, the next phase of the exchange will be able to go to trade derivatives from these indicators instruments such as futures contracts. This will call for domestic producers and processors of the business environment in relation to our main competitors on the world market of oil and fat products having similar tools for centuries, and will contribute to the achievement of the Federal project exports of agricultural products", - commented the Executive Director of the oil and fat Union of Russia Mikhail Maltsev. Bidding will be conducted on the trading and clearing platform Harvest on the basis of which is trading in exchange-traded derivative financial instruments for grain and sugar. Currently, out of 54 accredited Exchange elevators exercise 33 storage of sunflower in different regions of Russia, more than 10 elevators are in the process of obtaining accreditation. In addition, from 20 December for the trading of soy to the only basis of delivery – Bureiskaya HPP in the Amur region – added 12 bases in different regions of the Russian Federation. Upon delivery of the sunflower will use the infrastructure of Rusagrotrans.